If you want to experience the best outdoor shopping in Branson this season, visit Branson Landing which has something for everyone. As one of the most visited attractions in town, Branson Landing, a center for great shopping and dining opportunities, located between Lake Taneycomo and historic downtown Branson appeals to visitors of all ages. Offering more than 100 retail shops and fine restaurants, the easily walkable Branson Landing is less than a mile long that features an open-air promenade and a lakeside boardwalk. This shopping mall features the Belk department store on the north end and Bass Pro Shop on the south end. The fascinating attraction in Branson Landing is its town square where you can see the spectacular $7.5 million Fountain Show that features water, fire, light and music. At the open promenade, you can sit and watch the choreographed display of 120-foot fountain geysers and fire columns interplay with dazzling lights and your favorite musical hits. As you explore the open area outside Branson Landing mall, you will find a floating restaurant along Lake Taneycomo that offers great food. No matter what your vacation in Branson includes, from watching live entertainment shows, enjoying exciting attractions, fine dining to camping and great outdoor adventure, you’re sure to spend a little enjoying a vacationer’s favorite past time, shopping. And to get out the most of shopping in Branson, let Branson Landing give you the shopping items you need. As the most visited shopping center in Branson with abundant retail shops, Branson Landing is a great place to find jewelry, gifts and apparel, to housewares, sports-fan favorites and bass boats including fishing equipments and gears. 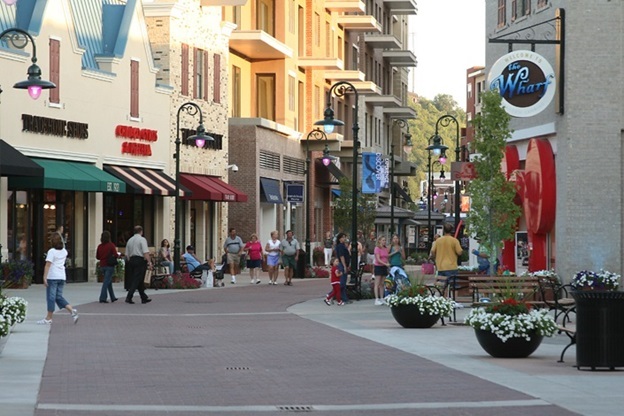 Branson Landing is a great shopping place where shoppers can find name brands at their favorite retail chains such as Belk Department Store that offers brands from Liz Claiborne to Nike, Dressbarn, Chico’s, Christopher & Banks and Famous Footwear, to name a few. You will also find boutiques and special shops that feature locally owned favorites like Branson Quilts, Dove Olive Oil and Gifts of Distinction. The landing also has a variety of niche shops like Cardinals Clubhouse and its great selection of St. Louis Cardinals gear and apparel. Another popular store in Branson Landing is Branson Quilts where you can find a wide selection of bedspread, interior décor, or a comforter to help keep your loved feel warm during winter. Aside from spending a wonderful shopping at Branson Landing, you can extend your outdoor shopping to Branson Craft Mall which features some 200 booths that boast different kinds of wares, from stained glass to pottery to Christmas décor. In this craft mall, don’t miss the opportunity to sample (or chow down) on sweets from Branson Fudge Company or grab a sandwich from the Pickin’ Porch Deli so you can add strength for more shopping. As one of the most visited attractions in town, Branson Landing has more than 100 retail shops and fine restaurants to meet your shopping and dining needs.